This cabinet has an extremely punchy low end, with a Jaco-like mid range and contains three 10 inch speaker drivers. The top speaker is a coaxial design with a center mounted tweeter crossed over at 3.5 KHz with user adjustable level control. 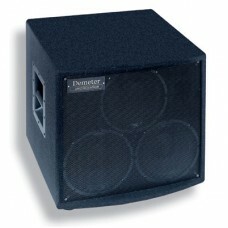 Power handling capacity is 450 watts rms. Cabinet dimensions are 22W x 20.5H x 17D. Operates at 6 ohms.